Phosphatidylinositol-specific phospholipases (PI-PLCs) are virulence factors produced by many pathogenic bacteria, including Bacillus anthracis and Listeria monocytogenes. Bacillus PI-PLC differs from Listeria PI-PLC in that it has strong activity for cleaving GPI-anchored proteins. Treatment of murine DCs with Bacillus, but not Listeria, PI-PLC inhibited dendritic cell (DC) activation by TLR ligands. Infection of mice with Listeria expressing B. anthracis PI-PLC resulted in a reduced Ag-specific CD4 T cell response. These data indicate that B. anthracis PI-PLC down-modulates DC function and T cell responses, possibly by cleaving GPI-anchored proteins important for TLR-mediated DC activation. Dendritic cells (DCs)3 are an important link between innate and adaptive immunities (1). Specific recognition of pathogen-derived products by TLRs activates a signaling cascade that leads to activation of the DC. Activation leads to greater expression of costimulatory molecules and cytokines, both of which enhance the DC’s ability to stimulate T cells (1). DCs respond to different pathogens and initiate the appropriate type of T cell response needed to control infection. In contrast, various pathogens have evolved mechanisms to counteract this arm of the immune system (2). By down-modulating DC activation, a pathogen can interfere with the ability of the immune system to respond appropriately to each infection. In light of the potential use of Bacillus anthracis as a bioterror agent, there is an urgent need to gain a better understanding of its pathogenesis and the host immune response to this deadly bacterial pathogen. In pulmonary B. anthracis infection, bacteria quickly disseminate and replicate to high titers, which, if untreated, lead to death (3). The inability of the host to control infection suggests that B. anthracis may be actively down-modulating the immune response. Lethal toxin, an important virulence factor, has been shown to down-modulate DC activation in vitro due to its ability to block activation of the MAPK pathway via inhibition of p38 MAPK (4, 5). The complete genome sequence of B. anthracis has revealed that this bacterium encodes proteins homologous to many known virulence factors in other pathogenic bacteria, including a hemolysin and two phospholipases C (PLCs) from Listeria monocytogenes (6). The functions of these putative virulence factors in B. anthracis pathogenesis remain unknown. PLCs are produced by different bacterial pathogens and are important virulence factors that play diverse roles in pathogenesis (7). For example, the two distinct PLCs expressed by L. monocytogenes play overlapping and unique roles in the escape of bacteria from phagolysosomes (8, 9). In addition, the broad-range PLC (encoded by plcB) induces up-regulation of Fas ligand on T cells (10), and the two PLCs differentially modulate host cell signaling pathways, including Ca2+ signaling in macrophages (11) and phosphoinositide metabolism in endothelial cells and macrophages (11, 12). The pathogenic Bacillus species, B. cereus, B. thuringiensis, and B. anthracis, all express phosphatidylinositol-specific phospholipases (PI-PLCs) that have >94% amino acid identity (6, 13, 14). PI-PLCs play an important role in B. cereus pathogenesis, because B. cereus deficient in this enzyme are less able to cause disease (15). However, the mechanism of PI-PLC contribution to the virulence of B. cereus is not known, and the role of PI-PLC in the pathogenesis of other pathogenic Bacillus species, including B. anthracis, has not been examined. 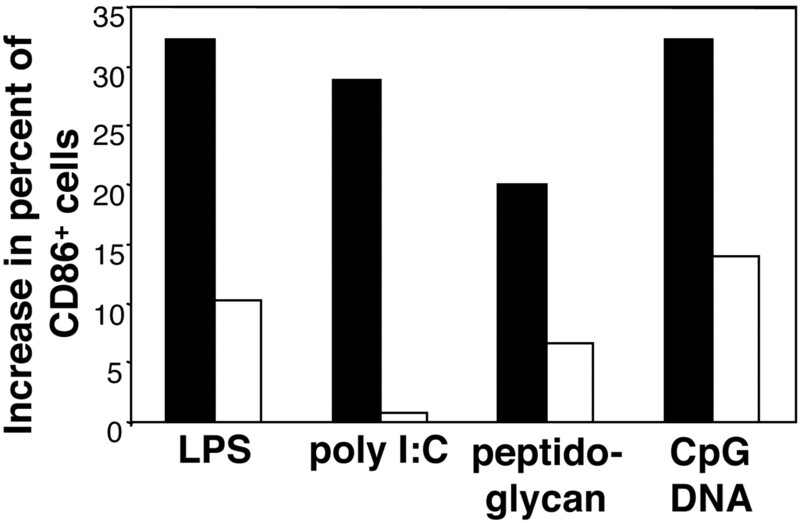 The PI-PLCs from Listeria and Bacillus species have similar enzymatic activity for cleaving phosphatidylinositol (PI) to diacylglycerol and inositol-1-phosphate (16). Bacillus PI-PLC has strong activity in the cleavage of GPI-anchored proteins, which Listeria PI-PLC lacks (17, 18). Although Listeria and Bacillus PI-PLCs have similar overall structures, Bacillus PI-PLC has an extra β strand that is critical for the interaction between the enzyme and the GPI anchor (19). GPI-anchored proteins are surface proteins that lack a transmembrane domain and are instead inserted into the cell lipid bilayer through a covalent GPI modification at the C terminus (20). GPI-anchored proteins participate in a variety of host cell functions, particularly in mediating host cell signaling. There are many GPI-anchored proteins, but only a limited number have been identified; most notable are an LPS receptor (CD14) and FcγRIII (CD16), expressed by APCs. It is possible that Bacillus PI-PLC has evolved to cleave GPI-anchored proteins to down-modulate the immune response and contribute to the pathogenesis of this bacterium. In this study we show that treatment of DCs with purified Bacillus PI-PLC affected the ability of DCs to respond to TLR ligand stimulation as measured by reduced costimulatory and MHC molecule up-regulation, TNF-α production, and MAPK signaling. In contrast, DC functions were not affected by Listeria PI-PLC, which differs from Bacillus PI-PLC in its inability to efficiently cleave GPI-anchored proteins. Infection of mice with L. monocytogenes expressing B. anthracis PI-PLC resulted in reduced CD4 T cell priming. These data indicate that Bacillus PI-PLC down-modulates DC function, possibly by removing GPI-anchored proteins important for DC activation. DCs were cultured from the bone marrow of C57BL/6 mice as previously described (21). DCs were left untreated or treated for 1 h with 6 μg/ml purified recombinant Bacillus or Listeria PI-PLC unless otherwise indicated. Polyinosine-polycytidylic acid (poly I:C), LPS, peptidogylcan (Sigma-Aldrich), or CpG DNA (5′-TCCATGACGTTCCTGATGCT-3′) was then added at the indicated concentration for the indicated time. Recombinant B. thuringienesis and L. monocytogenes PI-PLC were provided by M. F. Roberts (Boston College, Chestnut Hill, MA). They were expressed in Escherichia coli and purified as previously described (22). B. thuringienesis PI-PLC shares high homology with PI-PLC from other Bacillus species. Between the mature PI-PLC of B. thuringienesis and B. anthracis there are only two amino acid differences, one of which is a conservative substitution. These two residues are not important for substrate binding or catalysis (23). Annexin V and 7-aminoactinomycin D (7-AAD) staining were performed according to manufacturer’s directions (BD Pharmingen). For surface staining of DCs, cells were stained with mAb anti-CD11c (clone HL3), anti-CD86 (clone GL1), anti-CD80 (clone 16-10A1), and anti-MHC II (clone 2G9) in 1% BSA/PBS with FcR block. All mAb for FACS were purchased from BD Pharmingen. After several washes in 1% BSA/PBS, cells were fixed with 2% paraformaldehyde and analyzed by FACS. For intracellular staining to analyze TNF-α production, DCs were incubated for 5 h at 37°C with 5% CO2 in the presence of GolgiStop (BD Pharmingen). DCs were surface stained as described above with anti-CD11c, and then, according to the manufacturer’s protocol, DCs were permeabilized with Cytofix/Cytoperm solution, stained with anti-TNFα mAb (clone MP6-XT22), fixed, and analyzed by FACS. TNF-α in DC supernatants was measured by ELISA according to the manufacturer’s directions (R&D Systems). DCs were pretreated with 6 μg/ml PI-PLC for 1 h, then stimulated with the indicated concentration of poly I:C for 60 min. Na3VO4 (1 mM) was added to inhibit phosphatases. Cells were lysed in sample buffer with 100 mM DTT, and lysates were separated on a 4–15% gradient gel. A Western blot was performed using one of the following Abs: rabbit polyclonal anti-ERK (p44/42 MAPK), anti-p38 MAPK, or Abs that recognize the phosphorylated forms of these proteins (Cell Signaling Technology). Blots were developed by ECL, and bands were quantitated using Image Gauge (version 4.01; Fuji). Recombinant L. monocytogenes was constructed using the highly attenuated ΔdalΔdat mutant as the parental strain (Lm) (24). An L. monocytogenes strain with an in-frame deletion of plcA (Lm ΔplcA) was constructed on the ΔdalΔdat background using alleic exchange methods described previously (25). The gene encoding B. anthracis PI-PLC was then integrated into the chromosome of the Lm ΔplcA strain, generating a strain with the B. anthracis PI-PLC gene under control of the Listeria plcA promoter and signal sequence (Lm ΔplcA: Ba PI-PLC). PI-PLC activity on PI was determined by measuring the cleavage of l-3-phosphatidyl-[2-3H]inositol by the purified enzymes or supernatants of overnight cultures as previously described (17). Activity on GPI-anchored proteins was determined by incubating either enzymes or concentrated supernatants from overnight bacterial cultures with T cells for 1 h at 37°C. Cells were then surface stained, as described above, with mAb to the GPI-anchored protein Thy1 (clone 53-2.1) and analyzed by FACS. C57BL/6 mice were i.v. infected with 2 × 108 CFU of Lm or Lm ΔplcA: Ba PI-PLC in PBS. Twenty milligrams of d-alanine was injected with the bacteria to allow transient bacterial growth in vivo. Bacterial loads in the spleen and liver were determined by plating serial dilutes of organ homogenates on brain heart infusion agar with 100 μg/ml d-alanine. Splenocytes from day 7 postinfection mice were stimulated with or without listeriolysin O190–201 (LLO190–201) peptide, and intracellular IFN-γ staining was performed as previously described (26). The pathogenic Bacillus species, B. cereus, B. thuringiensis, and B. anthracis, all express PI-PLCs that have >94% amino acid identity (6, 13, 14). To investigate whether Bacillus PI-PLC modulates DC function, we treated DCs with or without Bacillus PI-PLC for 1 h, then stimulated them for 18 h with TLR ligands, including LPS (TLR4), poly I:C (TLR3), peptidogylcan (TLR2), and CpG DNA (TLR9). DC activation was examined by staining for surface expression of CD86, which is up-regulated upon TLR stimulation. Bacillus PI-PLC treatment greatly reduced the percentage of DCs that expressed high levels of CD86 upon TLR stimulation, and this was true for all four TLR ligands tested (Fig. 1⇓). Thus, Bacillus PI-PLC reduced the ability of DCs to become activated and up-regulate the costimulatory molecule CD86 in response to various TLR ligands. Bacillus PI-PLC inhibits DC activation by TLR ligands. DCs were incubated with 6 μg/ml B. thuringienesis PI-PLC (□) or were left untreated (▪) for 1 h and then stimulated for 18 h with 1 μg/ml LPS, poly I:C, or peptidoglycan or with 1 μM CpG DNA. DC activation was determined by measuring up-regulation of CD86 on the cell surface using flow cytometry. The increase in the percentage of CD86+ DCs compared with non-TLR ligand-stimulated DCs was determined by subtracting the percentage of CD86+ of nontreated cells from the percentage of cells that were CD86+ after the indicated experimental treatment. Data are representative of two independent experiments. To further investigate the inhibitory effect of Bacillus PI-PLC on DC activation, we examined 1) the surface expression of several surface markers (CD80, CD86, and MHC class II) upon stimulation with various concentrations of poly I:C, 2) the effect of Bacillus PI-PLC on the viability of DCs, and 3) the potency of PI-PLC in inhibiting DC activation. Bacillus PI-PLC inhibited DC activation over a range of poly I:C concentrations (0.1–10 μg/ml), resulting in reduced up-regulation of CD80, CD86, MHC class II surface expression compared with non-PI-PLC-treated DCs (Fig. 2⇓A). This phenotype cannot be attributed to increased cell death, because DCs treated with or without PI-PLC had similar annexin V and 7-AAD staining profiles (Fig. 2⇓B). Titration of Bacillus PI-PLC resulted in a dose-dependent inhibition of the activation of DCs (Fig. 2⇓C). Inhibitory effects were observed at a concentration as low as 1 ng/ml. Thus, Bacillus PI-PLC reduced the ability of DCs to become activated and up-regulate the surface expression of costimulatory and Ag presentation molecules in response to TLR stimulation. Specific inhibition of DC activation by Bacillus PI-PLC. A, DCs were incubated with 6 μg/ml B. thuringienesis PI-PLC (□) or were left untreated (▪) for 1 h, then stimulated with the indicated dose of poly I:C for 18 h. DCs were stained for CD86, CD80, and MHCII. Bars represent an increase in the percentage of the DC population expressing these surface molecules compared with non-poly I:C-, non-PI-PLC-stimulated DCs. Results are representative of two independent experiments. B, DCs from A were stained with annexin V and 7-AAD. The number represents the percentage of total cells in each quadrant: live (annexin V−, 7-AAD−), apoptotic (annexin V+, 7-AAD−), and necrotic/late apoptotic (annexin V+, 7-AAD+) cells. The results are representative of two experiments. C, DCs were incubated for 1 h with 10-fold dilutions of Bacillus PI-PLC and stimulated with 1 μg/ml poly I:C for 18 h, then DC activation was determined by measuring surface up-regulation of CD86. One hundred percent activation was set at non-PI-PLC-treated cells stimulated with poly I:C, and 0% activation was set at the population of CD86+ cells of non-poly I:C-stimulated cells. The results are representative of two independent experiments. To determine whether the inhibitory effect on DC activation is unique to Bacillus PI-PLC or is shared by other bacterial PI-PLCs, we compared treatment with Bacillus and Listeria PI-PLC on DC activation. Listeria and Bacillus PI-PLC had comparable activity in the cleavage of PI, but only Bacillus PI-PLC had the ability to cleave GPI-anchored proteins (Fig. 3⇓, A and B). No defect was observed in CD86 up-regulation when cells were treated with Listeria PI-PLC before poly I:C stimulation (Fig. 3⇓C). In addition to increased surface expression of costimulatory and Ag presentation molecules, DC activation is characterized by cytokine production. Therefore, we also examined whether Bacillus or Listeria PI-PLC treatment of DCs affected the ability of the DCs to produce TNF-α. Non-PI-PLC-treated DCs produced TNF-α in a dose-dependent manner in response to poly I:C stimulation. Treatment of DCs with Bacillus PI-PLC inhibited the ability of DCs to produce TNF-α in response to poly I:C stimulation (Fig. 3⇓D). At 1 μg/ml poly I:C, only 5% of Bacillus PI-PLC-treated cells produced TNF-α compared with 20% of DCs producing TNF-α in the control group without Bacillus PI-PLC treatment. This defect in cytokine production by Bacillus PI-PLC-treated DCs was also evident when measured by TNF-α secretion into the cell supernatant after overnight stimulation (Fig. 3⇓E). In contrast, Listeria PI-PLC-treated DCs produced TNF-α at comparable levels to non-PI-PLC-treated cells (Fig. 3⇓, D and E). Thus, Bacillus, but not Listeria, PI-PLC affects the ability of DCs to respond to TLR ligands. Because the major difference between Bacillus and Listeria PI-PLC is the inability of Listeria PI-PLC to cleave GPI-anchored proteins, these data suggest that modulation of DC function by Bacillus PI-PLC may be due to its ability to cleave GPI-anchored proteins from the DC surface that are important for activation. Bacillus, but not Listeria, PI-PLC inhibits activation of DCs. A, Activities of B. thuringienesis and L. monocytogenes PI-PLC on cleavage of PI. PI activity was quantitatively measured and expressed as nanomoles of PI hydrolyzed per minute per microgram of protein. B, Activities of B. thuringienesis and L. monocytogenes PI-PLC on cleavage of GPI-anchored proteins. T cells were treated with Bacillus PI-PLC (dashed line) or Listeria PI-PLC (solid line) or were left untreated (shaded region). Surface expression of the GPI-anchored protein Thy1 was detected by mAb staining, followed by FACS. The results are representative of three independent experiments. C, DC activation measured by CD86 up-regulation. DCs were incubated with 6 μg/ml B. thuringienesis or L. monocytogenes PI-PLC or were left untreated for 1 h, then stimulated with the indicated dose of poly I:C for 18 h. DCs were stained for CD11c and CD86. Histograms are gated on CD11c+ cells (>95% of samples). Shaded regions are the controls without poly I:C stimulation; black lines are DCs stimulated with 1 μg/ml poly I:C. Numbers below plots indicate the percentage ± SD of cells that are CD86high (as gated in histograms) when stimulated with or without poly I:C. D and E, DC activation measured by TNF-α production. DCs were treated as described in C, except poly I:C stimulation was for 5 h in the presence of GolgiStop for intracellular TNF-α staining (D). Plots are gated on CD11c+ cells (>95% of sample), and the numbers indicate the percentages of CD11c+ cells that produce TNF-α. TNF-α in the cell supernatants was measured by ELISA after 18-h poly I:C stimulation (E). Bars represent the mean ± SD of three samples. All experiments were performed three or four times with similar results. TLR interaction with their ligands leads to activation of the MAPK signaling pathway, which, in turn, results in activation of transcription factors responsible for up-regulation of costimulatory molecules and cytokines (27, 28). To further examine the effect of Bacillus PI-PLC on DC activation, we analyzed activation of the MAPK signaling pathway by measuring phosphorylation of the MAPKs ERK (p44/42) and p38. Compared with untreated DCs, DCs treated with Bacillus PI-PLC had less phosphorylated ERK or p38 in response to poly I:C stimulation (Fig. 4⇓). These data indicate that Bacillus PI-PLC down-modulates MAPK pathway signaling in DCs. Previous studies have shown that lethal toxin also blocks MAPK signaling (4, 5). Thus, B. anthracis has multiple virulence factors that interfere with this important signaling pathway central to the initiation of an effective immune response. Bacillus PI-PLC treatment inhibits MAPK pathway signaling. A, DCs were treated with B. thuringienesis PI-PLC for 1 h or were left untreated and then stimulated with the indicated concentration of poly I:C for 60 min. Cell lysates were separated by SDS-PAGE, transferred to membrane, and then probed with either Abs specific to p38 or ERK (total p38 and total ERK) or specific to the phosphorylated forms of p38 or ERK (phos-p38 and phos-ERK). Data are representative of two independent experiments with similar results. B, Bands on the blots in A were quantitated using ImageGauge software, and the fold increase in expression was calculated by dividing the values of the indicated treatments by the value of non-PI-PLC-, non-poly I:C-treated cells. Because Bacillus PI-PLC treatment of DCs before activation results in reduced surface expression of costimulatory molecules and cytokine production, we hypothesized that Bacillus PI-PLC may down-modulate the cellular immune response by interfering with DC function. As a first step in examining whether Bacillus PI-PLC has an effect on the T cell response, we investigated whether expression of this protein in L. monocytogenes would affect the T cell response, taking advantage of the well-defined murine model of listeriosis that allows for quantitative analysis of Ag-specific T cell responses in vivo. A recombinant L. monocytogenes strain was constructed that has its PI-PLC gene (plcA) replaced by the B. anthracis PI-PLC gene. A highly attenuated ΔdalΔdat mutant of L. monocytogenes was used as the parental strain due to concerns about introducing B. anthracis genes into another pathogen (24). The ΔdalΔdat stain has deletions of two genes encoding the enzymes d-alanine racemase (dal) and d-amino acid aminotransferase (dat) that are required for synthesizing d-alanine, an essential component of the cell wall. Because d-alanine cannot be obtained from the environment or host cells, these bacteria can grow only when d-alanine is provided and thus are highly attenuated in vivo. L. monocytogenes strains expressing endogenous PI-PLC or Bacillus PI-PLC had similar activity on the cleavage of PI (Fig. 5⇓A), as expected because Listeria and Bacillus PI-PLC have comparable PLC activity on PI (17). In contrast, only supernatants from L. monocytogenes expressing B. anthracis PI-PLC had significant GPI anchor cleavage activity, as measured by their ability to cleave the GPI-anchored protein Thy1 from the surface of T cells (Fig. 5⇓B). This indicates that the recombinant L. monocytogenes strain indeed expresses the Bacillus PI-PLC with a strong activity for GPI anchor cleavage. 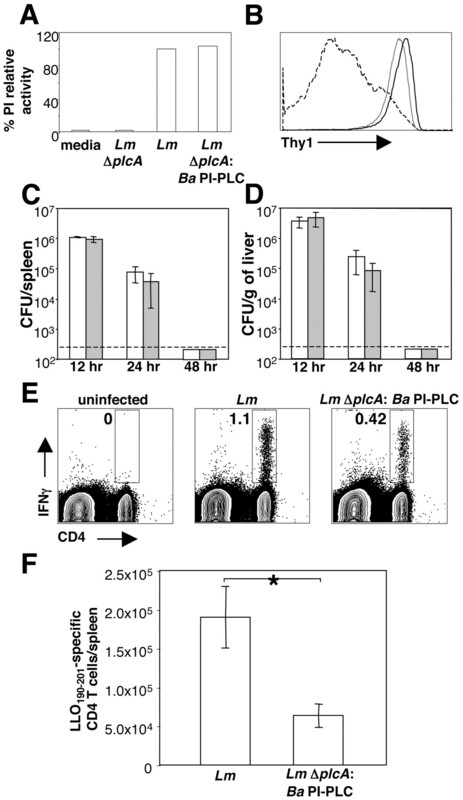 L. monocytogenes expressing B. anthracis PI-PLC induces suboptimal T cell priming. A, Activity on PI. The PI cleavage activity was measured in the supernatants of overnight cultures of the parental L. monocytogenes strain (Lm), the strain lacking Listeria PI-PLC (Lm ΔplcA), or the strain expressing B. anthracis PI-PLC (Lm ΔplcA: Ba PI-PLC) and is expressed relative to the parental Lm strain. B, Activity on GPI-anchored proteins. T cells were treated with concentrated supernatants from overnight cultures of Lm (gray line) or Lm ΔplcA: Ba PI-PLC (dashed line) or were left untreated (black line). Surface expression of the GPI-anchored protein Thy1 was detected by mAb staining, followed by FACS. C and D, C57BL/6 mice were infected with Lm (□) or Lm ΔplcA: Ba PI-PLC (▦). Bacterial loads in the spleen (C) and liver (D) were determined 12, 24, and 48 h after infection (mean ± SD of three mice). Bacterial loads in the spleen and liver were not significantly different between the strains (p > 0.05, by Student’s t test). E, LLO190–201-specific CD4 T cells in the spleen were determined by intracellular cytokine staining assay on day 7 after infection with Lm or Lm ΔplcA: Ba PI-PLC. FACS plots are shown from one representative mouse of a group of three or four animals. The number indicates the mean percentage of CD4 T cells specific to LLO190–201. F, Total numbers of LLO190–201-specific cells per spleen on day 7 after infection were calculated (mean ± SD; three or four mice per group). The difference between Lm and Lm ΔplcA: Ba PI-PLC is statistically significant (p = 0.007, by Student’s t test). The experiment was performed twice, with similar results. To investigate whether B. anthracis PI-PLC modulated the immune response, C57BL/6 mice were infected with L. monocytogenes expressing endogenous PI-PLC or B. anthracis PI-PLC. Similar bacterial loads between the two strains were recovered from the spleens and livers of mice at 12 and 24 h postinfection (Fig. 5⇑, C and D). By 48 h postinfection, both strains were cleared from the spleens and livers of infected mice. On day 7 after infection, the Ag-specific CD4 T cell response was analyzed by intracellular cytokine staining after stimulation with LLO190–201, an I-Ab-restricted epitope derived from the L. monocytogenes protein LLO (29). A greater percentage of CD4 T cells were specific to the LLO190–201 epitope in mice infected with the parental strain of L. monocytogenes than in mice infected with L. monocytogenes expressing B. anthracis PI-PLC (Fig. 5⇑E). When the total number of LLO190–201-specific CD4 T cells per spleen was calculated, mice infected with the parent L. monocytogenes strain had ∼3-fold more LLO190–201-specific CD4 T cells than mice infected with L. monocytogenes expressing B. anthracis PI-PLC (Fig. 5⇑F). These in vivo results show that B. anthracis PI-PLC expression results in a reduced Ag-specific CD4 T cell response to infection. Previous studies have shown that the lethal toxin of B. anthracis interferes with DC function by blocking the MAPK signaling pathway (5). Our study indicates that B. anthracis PI-PLC also functions to down-modulate activation of DCs by TLR ligands. Thus, like many pathogenic bacteria, B. anthracis uses multiple virulence factors to interfere with the host response. Collectively, these virulence factors have been shown to exert a profound impact on the ability of the immune response to control infection in other bacterial systems. It remains to be determined whether there are other virulence factors in B. anthracis that are involved in immune modulation and to what extent each of these factors, including lethal toxin and PI-PLC, contributes to the down-modulation of the host response in the context of B. anthracis infection. To this end, we are currently generating B. anthracis deficient in PI-PLC to investigate its role in pathogenesis and in modulation of the host response during infection. Heterologous expression of PI-PLC in L. monocytogenes allows for quantitative analysis of Ag-specific T cell responses and provides evidence that B. anthracis PI-PLC plays a role in the down-modulation of the immune response during infection. Recombinant L. monocytogenes expressing B. anthracis PI-PLC induced a lower level of Ag-specific CD4 T cell response compared with that induced by the parental control strain (Fig. 5⇑, E and F). This difference was not due to reduced Ag load, because the kinetics of bacterial clearance in vivo were similar between the two strains (Fig. 5⇑, C and D). 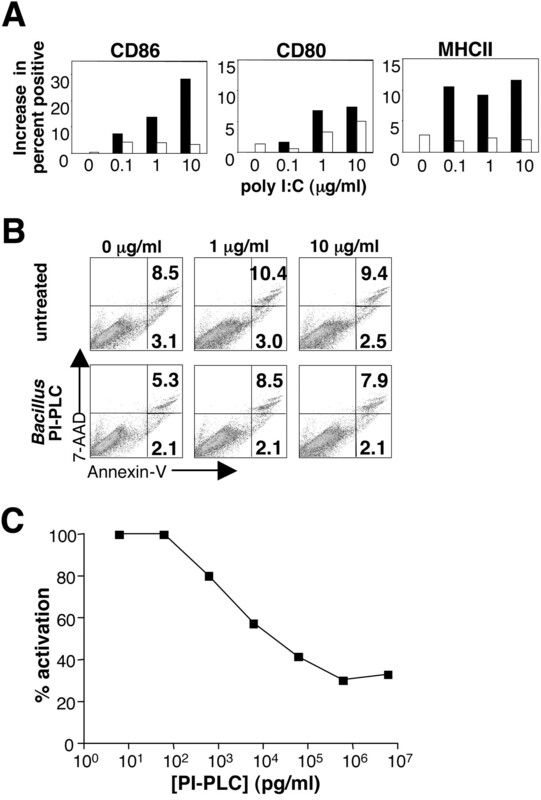 If anything, the expression of B. anthracis PI-PLC is expected to lead to down-modulation of the host response, leading to an increase in virulence and bacterial replication in vivo. However, any potential increase in virulence due to B. anthracis PI-PLC modulation of the immune response may not become apparent in the ΔdalΔdat mutant background that was used in this study. The ΔdalΔdat mutant requires d-alanine for growth and cannot undergo more than two rounds of replication in vivo. As a result, severe attenuation by ΔdalΔdat mutations probably overrides any effect B. anthracis PI-PLC may have on L. monocytogenes replication in vivo. Alternatively, it is possible that the GPI-anchored proteins are important for inducing optimal adaptive responses, but not for activating components of the innate immune response that are critical for early control of bacterial replication. In addition, L. monocytogenes is mainly an intracellular pathogen, whereas B. anthracis is only transiently found in the cytosol of macrophages and replicates extracellularly. The adaptation to the extracellular and intracellular life cycles of these pathogens may have selected for differences in the ability of Bacillus and Listeria PI-PLC to cleave GPI-anchored proteins. As such, B. anthracis PI-PLC may play a greater role than we have observed in our heterologous expression system. Nevertheless, our results clearly demonstrate that Bacillus PI-PLC inhibits DC activation in vitro and down-modulates the T cell response in vivo. How does Bacillus PI-PLC inhibit the activation of DCs by TLR ligands? Recently, it has been shown that virulence factors secreted by bacterial pathogens can directly stimulate DCs. For example, anthrolysin O, a cytolysin from B. anthracis, is recognized by TLR4, leading to activation of DCs (30). Treatment of DCs with Bacillus or Listeria PI-PLC resulted in a very low level of activation, as evidenced by a minimal increase in the expression of surface markers, TNF-α production and p38 phosphorylation (Figs. 2⇑A, 3⇑, D and E, and 4⇑). It is possible that PI-PLC may also act as a TLR agonist and that preactivation by Bacillus PI-PLC treatment may render DCs unresponsive to subsequent TLR stimulation. However, this is unlikely, because slight DC activation was also seen with Listeria PI-PLC treatment, yet Listeria PI-PLC did not inhibit subsequent DC activation by TLR stimulation. In contrast, a major difference between Bacillus and Listeria PI-PLC is the ability of Bacillus, but not Listeria, PI-PLC to cleave GPI-anchored proteins. Thus, modulation of DC function by Bacillus PI-PLC may relate to its ability to cleave from the DC surface a GPI-anchored protein(s) important for activation. There are a very limited number of known GPI-anchored proteins expressed by APCs; most notable are CD14 and CD16, an LPS receptor and FcγRIII, respectively. Although removal of CD14 might affect LPS stimulation via TLR4, inhibition of various other TLR signaling by Bacillus PI-PLC suggests that it may involve unknown GPI-anchored proteins that are important for TLR signaling. A recent study in Arabidopsis using new proteometric techniques has uncovered many novel GPI-anchored proteins (31). It is likely that DCs express many GPI-anchored proteins that are yet to be identified, and some of them might be involved in TLR signaling. GPI-anchored proteins are mostly associated with lipid rafts, which are important for receptor clustering and formation of active signaling complexes. Removal of GPI-anchored proteins by Bacillus PI-PLC may negatively impact receptor-mediated signaling and thus inhibit TLR-mediated DC activation. Lastly, this phenomenon may be independent of the enzymatic activity of Bacillus PI-PLC, but is instead due to its binding to the cell surface and blocking TLR-ligand interactions. We are currently investigating these possibilities in an effort to understand the mechanism(s) by which Bacillus PI-PLC modulates DC function. In the United States, the only anthrax vaccine approved for human use is an acellular vaccine that involves a cumbersome immunization regimen with considerable side effects and questionable efficacy (32). A live attenuated vaccine has been shown to confer better protection than the acellular vaccine and has been used in humans in the former Soviet Union (32). However, the live attenuated vaccine is only approved for use in livestock in the United States due to safety concerns. Further attenuation of the live vaccine is needed, but substantial attenuation frequently results in loss of immunogenicity, a paradox that often impedes live vaccine development. Rational approaches to selectively disable the immune-modulating virulence factors may allow us to attenuate virulence while maintaining or even improving immunogenicity. Our study has identified that B. anthracis PI-PLC, like lethal toxin, functions to down-modulate DC function and the adaptive immune response. We are constructing B. anthracis strains deficient in PI-PLC and lethal toxin to investigate the roles of these virulence factors in modulating the immune response and to test the use of these strains as potential live vaccines against B. anthracis infection. We gratefully acknowledge Mary F. Roberts (Boston College, Chestnut Hill, MA) for her kind gift of phospholipases, and Fred Frankel (University of Pennsylvania, Philadelphia, PA) for providing the L. monocytogenesΔdalΔdat strain. We thank Amy E. Troy and John K. Northrop for critical reading of the manuscript. ↵1 This work was supported by National Institutes of Health Grants AI45025 (to H.S.) and AI56275 (to H.G.). ↵3 Abbreviations used in this paper: DC, dendritic cell; 7-AAD, 7-aminoactinomycin D; LLO, listeriolysin O; PI, phosphatidylinositol; poly I:C, polyinosine-polycytidylic acid; PLC, phospholipase C.
Medzhitov, R.. 2001. Toll-like receptors and innate immunity. Nat. Rev. Immunol. 1: 135-145. Moll, H.. 2003. Dendritic cells and host resistance to infection. Cell Microbiol. 5: 493-500. Read, T. D., S. N. Peterson, N. Tourasse, L. W. Baillie, I. T. Paulsen, K. E. Nelson, H. Tettelin, D. E. Fouts, J. A. Eisen, S. R. Gill, et al 2003. The genome sequence of Bacillus anthracis Ames and comparison to closely related bacteria. Nature 423: 81-86. Schmiel, D. H., V. L. Miller. 1999. Bacterial phospholipases and pathogenesis. Microbes Infect. 1: 1103-1112. Smith, G. A., H. Marquis, S. Jones, N. C. Johnston, D. A. Portnoy, H. Goldfine. 1995. The two distinct phospholipases C of Listeria monocytogenes have overlapping roles in escape from a vacuole and cell-to-cell spread. Infect. Immun. 63: 4231-4237. Portnoy, D. A., V. Auerbuch, I. J. Glomski. 2002. The cell biology of Listeria monocytogenes infection: the intersection of bacterial pathogenesis and cell-mediated immunity. J. Cell Biol. 158: 409-414. Zenewicz, L. A., J. A. Skinner, H. Goldfine, H. Shen. 2004. Listeria monocytogenes virulence proteins induce surface expression of Fas ligand on T lymphocytes. Mol. Microbiol. 51: 1483-1492. Goldfine, H., S. J. Wadsworth. 2002. Macrophage intracellular signaling induced by Listeria monocytogenes.. Microbes Infect. : 1335-1343. Sibelius, U., T. Chakraborty, B. Krogel, J. Wolf, F. Rose, R. Schmidt, J. Wehland, W. Seeger, F. Grimminger. 1996. The listerial exotoxins listeriolysin and phosphatidylinositol-specific phospholipase C synergize to elicit endothelial cell phosphoinositide metabolism. J. Immunol. 157: 4055-4060. Volwerk, J. J., J. A. Koke, P. B. Wetherwax, O. H. Griffith. 1989. Functional characteristics of phosphatidylinositol-specific phospholipases C from Bacillus cereus and Bacillus thuringiensis.. FEMS Microbiol. Lett. 52: 237-241. Klichko, V. I., J. Miller, A. Wu, S. G. Popov, K. Alibek. 2003. Anaerobic induction of Bacillus anthracis hemolytic activity. Biochem. Biophys. Res. Commun. 303: 855-862. Callegan, M. C., D. C. Cochran, S. T. Kane, M. S. Gilmore, M. Gominet, D. Lereclus. 2002. Contribution of membrane-damaging toxins to Bacillus endophthalmitis pathogenesis. Infect. Immun. 70: 5381-5389. Sharom, F. J., M. T. Lehto. 2002. Glycosylphosphatidylinositol-anchored proteins: structure, function, and cleavage by phosphatidylinositol-specific phospholipase C. Biochem. Cell. Biol. 80: 535-549. Goldfine, H., C. Knob. 1992. Purification and characterization of Listeria monocytogenes phosphatidylinositol-specific phospholipase C. Infect. Immun. 60: 4059-4067. Gandhi, A. J., B. Perussia, H. Goldfine. 1993. Listeria monocytogenes phosphatidylinositol (PI)-specific phospholipase C has low activity on glycosyl-PI-anchored proteins. J. Bacteriol. 175: 8014-8017. Moser, J., B. Gerstel, J. E. Meyer, T. Chakraborty, J. Wehland, D. W. Heinz. 1997. Crystal structure of the phosphatidylinositol-specific phospholipase C from the human pathogen Listeria monocytogenes.. J. Mol. Biol. 273: 269-282. Low, M. G.. 1989. The glycosyl-phosphatidylinositol anchor of membrane proteins. Biochim. Biophys. Acta 988: 427-454. Lutz, M. B., N. Kukutsch, A. L. Ogilvie, S. Rossner, F. Koch, N. Romani, G. Schuler. 1999. An advanced culture method for generating large quantities of highly pure dendritic cells from mouse bone marrow. J. Immunol. Methods 223: 77-92. Feng, J., H. Wehbi, M. F. Roberts. 2002. Role of tryptophan residues in interfacial binding of phosphatidylinositol-specific phospholipase C. J. Biol. Chem. 277: 19867-19875. Gassler, C. S., M. Ryan, T. Liu, O. H. Griffith, D. W. Heinz. 1997. Probing the roles of active site residues in phosphatidylinositol-specific phospholipase C from Bacillus cereus by site-directed mutagenesis. Biochemistry 36: 12802-12813. Thompson, R. J., H. G. Bouwer, D. A. Portnoy, F. R. Frankel. 1998. Pathogenicity and immunogenicity of a Listeria monocytogenes strain that requires d-alanine for growth. Infect. Immun. 66: 3552-3561. Camilli, A., L. G. Tilney, D. A. Portnoy. 1993. Dual roles of plcA in Listeria monocytogenes pathogenesis. Mol. Microbiol. 8: 143-157. Zenewicz, L. A., K. E. Foulds, J. Jiang, X. Fan, H. Shen. 2002. Nonsecreted bacterial proteins induce recall CD8 T cell responses but do not serve as protective antigens. J. Immunol. 169: 5805-5812. Akira, S., K. Takeda. 2004. Toll-like receptor signalling. Nat. Rev. Immunol. 4: 499-511. Geginat, G., S. Schenk, M. Skoberne, W. Goebel, H. Hof. 2001. A novel approach of direct ex vivo epitope mapping identifies dominant and subdominant CD4 and CD8 T cell epitopes from Listeria monocytogenes.. J. Immunol. 166: 1877-1884. Park, J. M., V. H. Ng, S. Maeda, R. F. Rest, M. Karin. 2004. Anthrolysin O and other Gram-positive cytolysins are Toll-like receptor 4 agonists. J. Exp. Med. 200: 1647-1655. Borner, G. H., K. S. Lilley, T. J. Stevens, P. Dupree. 2003. Identification of glycosylphosphatidylinositol-anchored proteins in Arabidopsis: a proteomic and genomic analysis. Plant Physiol. 132: 568-577. Friedlander, A. M., S. L. Welkos, B. E. Ivins. 2002. Anthrax vaccines. Curr. Top. Microbiol. Immunol. 271: 33-60.